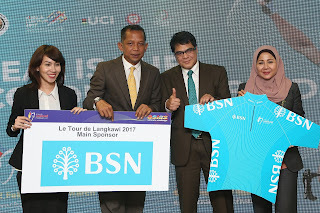 LTdL 2017 Head of Sponsorship and Marketing Sarah Yasmin Khairuddin, LTdL 2017 CEO Emir Abdul Jalal, BSN Deputy Chief Executive (Corporate Support), Ahmad Latfan Mohd Amran and BSN Senior Vice President (Head Strategic Communications) Puspa Marina Dato’ Hj Omar presents the Teal Sprint Champion Jersey and BSN Sponsorship. KUALA LUMPUR, 23 January 2017 : Fans attending the post-stages podium ceremonies of Le Tour de Langkawi will continue to cheer for the international race and their favourite cyclists from February 22 to March 1st. Partnering with BSN as one of the main sponsors, Teal remains the colour of speed – the Sprint Champion Jersey, one of the 4 jerseys up for grab throughout the race. “We are delighted to have BSN on board again. Their teal colour is now synonymous with speed at LTdL. It signifies passion, commitment and agility; the vital traits of a sprinter. Further, it is one of the colours of the points classification leader jersey at LTdL.”, said the CEO of Le Tour de Langkawi Emir Abdul Jalal. 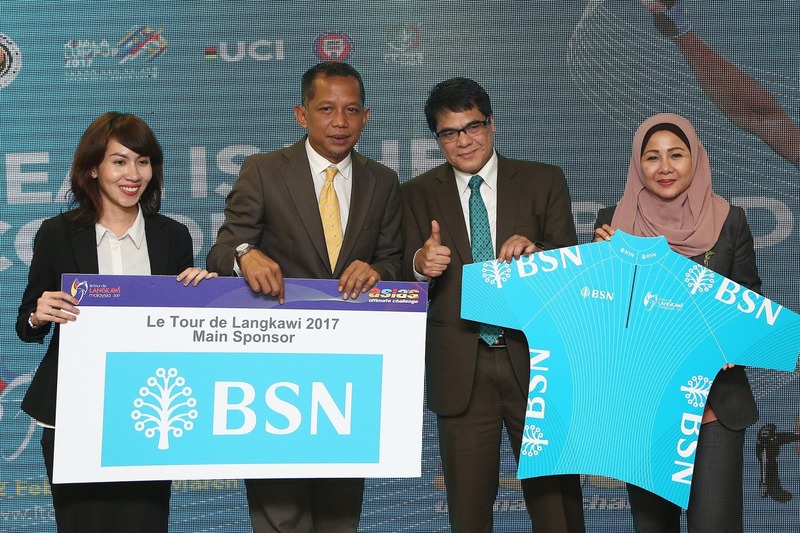 BSN Deputy Chief Executive (Corporate Support), Ahmad Latfan Mohd Amran said, BSN is of the main sponsors; sponsoring the Sprint Champion Jersey and also the Prize Money Presenter for the competition routes covering 8 stages which involves 5 states and 1 Federal Territory. “This is our second year partnering with LTDL as one of the main sponsors. Last year, our new corporate colour Teal was introduced as one of the 4 jerseys for grab at all stages. Teal the colour of speed is significantly relevant to not just BSN but also LTDL as it represents agility and the need for speed in order to win. At the same time, I believe the colour is also different yet vibrant and would make a nice jersey collection to be won among the sprinters. Additionally, as the colour connotes agility, it indicates LtDL still stand tall as one of the favourite international sporting events in Malaysia even after 20 years. ”. Ahmad Latfan added, “LTdL is an effective platform to reaffirm BSN’s brand positioning as an organization that provides financial services within easy reach. The race that goes to 8 stages allows us to have our presence and reach out to our customers directly at states. It gives us the opportunity to have meaningful engagement activities and effective channel to not only get closer to our customers but also to continue sharing our range of products and services, so that a better life is within their reach”. Last year, Italy’s Andrea Guardini became the first Teal Sprint rider to win the points competition three times [after 2011 and 2012]. Unfortunately, he would not be defending his title this time around after transferring from Astana to the UAE Abu Dhabi squad. His record number of 22 stage victories will remain out of reach for a few years but Le Tour de Langkawi will not remain short in talented sprinters and the 2017 route certainly appeals to them again. Malaysia’s Anuar Manan is the only Asian to have won the points competition since the inception of the race in 1996. He might as well be the only previous winner to line up this time around. “We’re yet to receive the entry forms of some the teams but we can already foresee a fierce battle between Italian and Australian sprinters”, the CEO of the 2017 Le Tour de Langkawi Emir Abdul Jalal predicted. Stage winners in 2016, Andrea Palini and Jakub Mareczko will be in action again while Australian outfit IsoWhey Sport Swisswellness had a second thought and decided to opt for former keirin Scott Sunderland to challenge the riders from the WorldTour and Pro Continental ranks. Organised by the Ministry of Youth and Sports Malaysia and managed by Ciclista Sports Sdn Bhd, the 22nd edition of Le Tour de Langkawi (LTdL) from 22 February to 1 March, 2017 is set to cover more than 1,200km over 8 stages, the UCI 2.HC (hors category) race featuring again as one of the biggest events on the UCI Asia Tour calendar.